A LIGHTWEIGHT Italian sportster with an exciting specification – that's the Ducati "Mach 1." This 249 cc ohc single differs from the established "Daytona" in having hotter cams, a bigger (29 mm) Dell' Orto carburetter, larger-diameter valves and five-speed gearbox. It is the gearing, oddly, which limits topend performance; the machine is definitely overgeared and the best one-way maximum of 83 mph was obtained in fourth. Roadholding and braking are up to racing standard and the "Mach 1" can, in fact, be converted for track use with an inexpensive kit supplied by the agents, Vic Camp Motorcycles. In that form, its gears might be more appropriate. Summary: A real get-your-head-down sportster with the handling of a thoroughbred. Grossly overgeared, the "Mach 1" felt too highly cogged even in fourth. But third was definitely slightly too l ow for tlat-on-tank speeds on a level road. Fifth is simply an overdrive. It was useful only with a strong tail wind or when bombing down a long main-road incline – at least, if high speed were the objective, although it would serve as an economical alternative to fourth for easy cruising at 50 or so. The unburstable and untiring motor, driven 50 miles flat against the stop from M45 to M10, was happier infourth than in fifth, and there were times when even fourth was too high – but third too low. 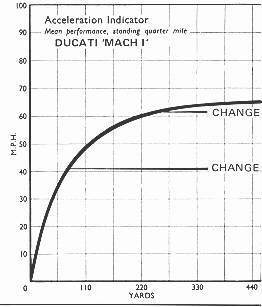 The Ducati would be a faster machine on a considerably lower cog. As it is, it can do a well silenced 80 without vibration and without loss of edge. A 5ft 10in tester logged a mean of 77 through the electronic timing trap. A smaller man managed 81. Rider bulk makes a real difference with this slim lightweight. Bottom, a surprisingly high cog for a five-speeder, was good for a searing 40 mph. Hill-climbing was fantastically lively, thanks to close second and third ratios. With the kit availiable, a perfect machine for a first-season racer. It was also observed that it did not have the lights for fast night riding. The Marzocchi front forks endowered the Mach 1 with good handling but it needed watching in high wind. Ever responsive The engine was free from megaphonitis and opened up cleanly from any speed. This was a motor to push – and keep on pushing. A racing riding position, firmly damped and twist-free suspension and lightweight produced outstanding cornering. Nothing could be grounded and the machine adhered to a perfect – and exceptionally tight – line. Because of its feather weight, high winds spelled trouble. And on a bumpy bend, because of the firmly-damped telescopic forks, the front wheel became skittish. Perhaps because of these idiosyncracies it became a habit to "lean-in" on corners. With five speeds in the box, an obvious requirement is a fast gearchange. And a 28 bhp power output needs a strong clutch. The "Mach 1" rider gets both. 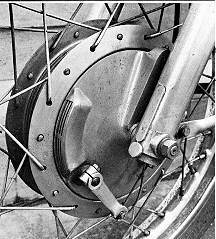 The six inch rear brake is on the oppersite side to the rear chain. Rocking pedal gear change sprouting off the footrest hanger. Kickstarter is on the clutch side however. The lack of flywheel effect and a small, slick selector movement produced a very fast change. 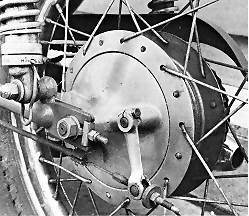 The rocking pedal, one up and four down, was considered too low at the heel by two of the three test riders. 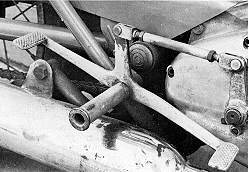 No adjustment could be made to the "set" of the splined lever because of the position of the exhaust pipe. The clutch could be left alone for all changes above second. It freed without fuss on the move, but neutral selection when the machine was at a standstill was difficult, although easier from second than bottom. Braking was smooth and certain. Both units were powerful, the front sufficiently so to lock the wheel. The fashion in which one can rush up to a corner, brake late and hard and pin the plot down to a tight line was an indication of the machine's possibilities on the track. Neither brake was affected by water. The best to be said of "Mach 1's" lighting is that at least it was legal. The headlight main beam shed only a small pool of light a few feet away, while the pilot was so dim as to be hardly visible under street lighting. These criticisms can be partly met, however. The test machine was fitted with a two-coil stator, while the latest model has twice that generator capacity. And Vic Camp has available a British Miller 36/30w headlight conversion. Filler for the wet sump system is surrounded by copious crankcase finning. Tyre pump is on front downtube. Italian optimism The Veglia speedometer, calibrated up to 150 mph, was too small for instant reading, wildly optimistic at high speeds and oscillated badly. And surely a rev-counter is an absolute must on a machine of this kind? The mileage recorder was seen, twice, to give incorrect rotation of the mileage drum. For this reason, the overall fuel consumption figure is suspect. The machine was easily lifted on to the very high centre stand. The fit of the lids of the twin toolboxes was poor, letting in water and road dirt. Handlebar and footrest positions more closely resemble a racer's than a sports machine's. As a result, it was easy and natural to slip into a flat-on-the-tank position. The rider was then perfectly relaxed for ceiling speeds. "Sitting up", the rider remained reasonably comfortable over a 20-mi1e daily journey in city traffic, although some ii eight was, of course, thrown on to the forearms. Rear wheel removal and refitting, involving splitting of the chain and disconnecting the brake cable, took some 10 minutes. The contact-breaker cover is secured by a simple clip and adjustment took only three minutes. The oil sump lubricates engine, gearbox and primary transmission and is drained by a single plug. Refilling was c;isier through the clutch cover than the narrow top orifice. ,ine for an oil change, five minutes. No complaints here, thanks to accessibility and an :idequate toolkit. To check the battery took 10 minutes because it was necessary to remove it from under the seat. Tappet adjustment is a real workshop job, however, '. quiring removal of the cylinder head to shim the valve .ips. Once set up, however, adjustment should be good for «iany thousands of miles. The test machine had completed some 3,500 miles in three months' hard use before delivery and its appearance had deteriorated in this period – mainly because of rusted wheel rims. The enamelling generally remained good, but in wet weather paint rubbed off the tank on to the inside of the .ider's knees. Oil-tightness of the engine was outstanding and was rnarred only by smears around the breather. Rattles developed at the front mudguard and front number-plate. 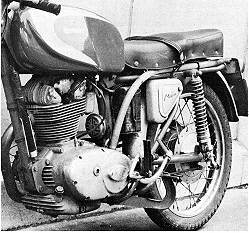 Engine: 249 cc single-cylinder four-stroke; ;ght-alloy cylinder head and barrel; 74 x 57.8 mm :.>ore and stroke; single bevel-driven ohc; cr. 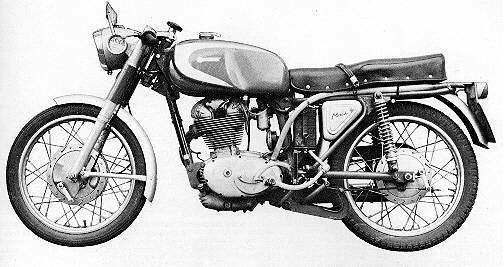 10:1; Dell' Orto 29 mm carburetter, with handlebar air control; wet-sump lubrication with gear pressure pump; makers' claimed output, 28 bhp at 8,500 rpm. Electrical Equipment: CEV ac generator charging 6-v 13ah battery through rectifier; coil ignition with auto advance; 6 in 25/25w headlamp, 3w pilot, 3/3w stop/tail; horn; lockable ignition switch. Transmission: Unit gearbox with rocking-pedal footchange; ratios, 5.4, 6.1, 7.5, 9.6 and 14.1. Speed at 1,000 rpm in top gear, 13 mph. Road speed equivalent to 8,500 rpm; first gear, 43 mph; second gear, 63 mph; third gear, 81 mph; fourth gear, 99 mph; fifth gear, 112 mph. Primary drive by helical gears; secondary by chain; multi-plate clutch in oil bath; rubber-vane shock absorber in rear hub. Frame: Single-downtube type with engine-unit forming a structural member. Suspension: Marzocchi hydraulicallv-damped telescopic front forks; rear swinging-fork with Marzocchi hydraulically-damped adjustable spring units. Wheels: Steel rims, 2.50 x 18 in. ribbed front, 2.75 x 18 in. studded rear tyres; 7 in. front and 6 in. rear rakes fuli-width hubs. 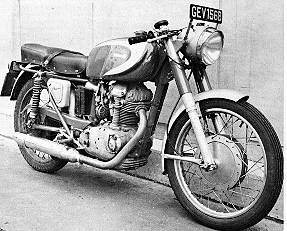 General Equipment: Centre stand; steering damper; 150 mph Veglia non-trip speedometer; handlebar l evers with finger adjusters; clip-on handlebars; Giulari dual set folding kickstarter; folding near-side footrest; twin toolboxes; small kit of tools. Finish: Red and silver. Dimensions: Overall length, 77 in., overall width, 23 in; wheelbase 51 in; seat height, 29 in. Price: E275 (inc E45 11s 4d PT) Makers: Ducati Meccanica Spa, Borgo Pan gale, Bologna, Italy. Concessionairs: Ducati Concessionaires Ltd. 80 Burleigh Road, Stretford, Lancs. Tel. 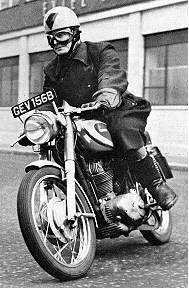 Longford 4674 (test machine loaned by Vic Camp Motorcvcles, 131 Queen's Road, London E17, Tel CQPpermill 2093. Conditions: Light and uncer(ain north-easterly wind, cold. Surface: damp asphalt, drying. Rider: 11 Y~ stone, normally seated except where stated, wearing two-piece suit, helmet and boots. Fuel: Super grade. Venue: Motor Industry Research Association Station, Lindley, Warwicks. Accurate, but reliability suspect (see text). Certified kerbside weight (with 1 gal fuel and toolsl 259 II3. If you need work done on your classic machine, from basic service to full rebuilds, contact me, I can help. netbikes is a registered business with the Queensland office of Consumer Affairs.